ADD 8 cups of water to the Cosori Multicooker and add 2 tablespoons of salt. SELECT Boil (H) and press Start/Cancel. Bring to a boil. BOIL the spaghetti for 8 to 10 minutes or until al dente. Drain and set aside. Reserve ½ cup of pasta cooking liquid. SELECT Sauté, add the olive oil and butter, and press Start/Cancel. ADD the garlic and shallot to the hot oil and cook until garlic is slightly brown. ADD in the anchovy fillet, red pepper flakes, and clams, and sauté for 2 minutes. POUR in the white wine, cover, and cook for 7 to 8 minutes or until the clams open. Remove the clams, leaving the liquid. ADD in the cooked pasta and mix well, adding pasta water if more liquid is needed. SERVE with toasted bread and a side of lemon wedges. ADD the water and salt to the Cosori Multicooker. ADD in your pasta and cook for 8 to 10 minutes or until pasta is al dente. DRAIN the pasta, reserving at least 1 cup of cooking water. SELECT Brown on the multicooker, change the temperature to 400°F, and press Start/Cancel. ADD the bacon while the multicooker is heating up and cook for about 15 minutes or until crisp. Drain and set aside. WHISK the eggs, egg yolks, Parmesan cheese, and black pepper together in a small bowl. Set aside. TURN OFF the multicooker and carefully remove the inner pot and place onto a flat surface. ADD the pasta into the bacon fat. Add about ½ cup of the cooking water, stirring continually. MIX the other half of the cooking water with the egg mixture, then add the egg mixture to the pasta and mix well. The result will be a thick, creamy sauce. SERVE with more Parmesan cheese and freshly ground black pepper. SELECT Brown on the Cosori Multicooker, set the temperature to 400°F, and press Start/Cancel. Allow the multicooker to heat up. ADD the oil and flour and mix to create a roux. COOK the roux until it is a deep brown, about 10 to 15 minutes. ADD in the onion, bell pepper, celery, and garlic. Cook for 10 minutes. MIX in the tomato paste and cook for 2 to 3 minutes. ADD in clam juice, cajun seasoning, celery seed, paprika, and cayenne pepper. Mix well. Press Start/Cancel. SELECT Simmer and press Start/Cancel. ADD the shrimp and butter. Cook for 10 minutes. SEASON with salt and pepper and a few dashes of hot sauce, to taste. SERVE over rice and garnish with chopped green onion. SELECT Sauté on the Cosori Multicooker and press Start/Cancel. Allow the multicooker to heat up. ADD the olive oil, garlic, and shallots. Cook for 3 to 5 minutes, until garlic is fragrant. ADD in the butter, red pepper flakes, white wine, lemon juice, and lemon zest. Press Start/Cancel and cover. 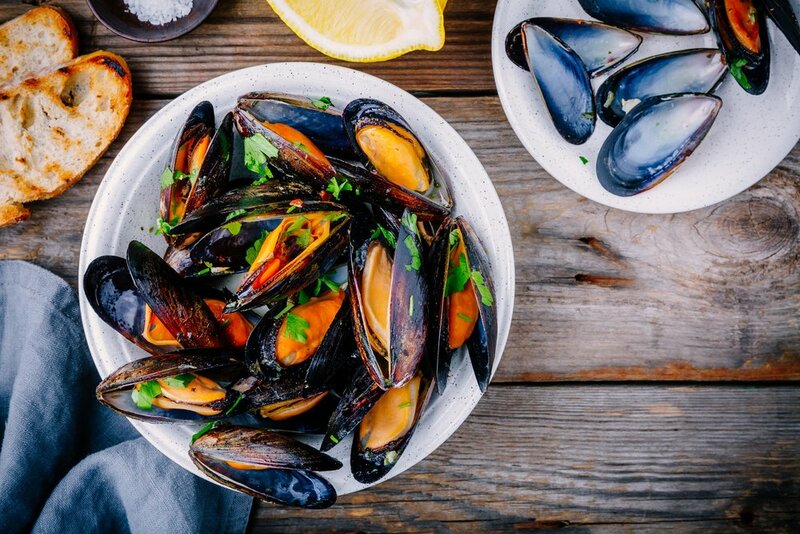 ADD in the mussels and cook for 12 minutes, or until the mussels have opened. GARNISH with fresh parsley and serve with bread to sop up all the juices. MIX salt and sugar together until well combined. Rub the salt-sugar mixture all over the duck legs. COMBINE the black peppercorns, juniper berries, garlic, thyme, and bay leaves together in a separate bowl. PACK the salted duck legs in a container, layering them with the black peppercorn and juniper berry mixture. Top off with any remaining salt-sugar mixture. COVER with plastic wrap and allow to cure in the refrigerator for 12 to 24 hours. RUB off any of the curing mixture using a paper towel when curing is done. Pat dry and set aside. MELT the duck fat in the multicooker and press Start/Cancel once the fat has melted. SUBMERGE the duck legs and thighs in the melted fat. Cover with lid. ALLOW the duck to cool in the fat and come to room temperature, when done cooking. TRANSFER to a container and chill overnight, making sure you reserve some of the duck fat. Remove the duck legs from the fridge when ready to cook. SELECT Brown on the multicooker, adjust temperature to 400°F, and press Start/Cancel. Allow the multicooker to heat up. ADD about 1 to 2 tablespoons of duck fat, then brown and crisp the duck, skin-side down, about 8 to 10 minutes. Flip over and cook skin-side up for 5 minutes. TRIM the ends of the asparagus and set aside. ADD 1 cup of water to the Cosori Multicooker and place the steam rack into the pot. SELECT Steam, set the time to 8 minutes, press Start/Cancel. PLACE your trimmed asparagus in the pot on top of the rack and cover. SHOCK the steamed asparagus, when done cooking, in an ice water bath to stop the cooking and preserve its bright green color. DRY OFF the asparagus and drizzle with extra-virgin olive oil. ADD juice of half the lemon, plus salt and pepper to taste. Toss asparagus until well coated. SERVE with additional lemon slices on the side. COOK the bacon until golden brown, about 10 to 15 minutes. Remove bacon from pot and set aside. ADD the brussel sprouts, garlic, and onion to the bacon fat. Cook for 15 minutes, allowing the brussel sprouts to turn golden brown. ADD in the chicken stock and press Start/Cancel. Cover with lid. SELECT Steam, adjust the time to 15 minutes, and press Start/Cancel. Cook the brussels sprouts until they are tender. SEASON with salt and pepper and top with the crispy bacon. SHRED 4 cups of cheddar cheese. Make sure to not use pre-shredded cheese. Using pre-shredded cheese will make your dish gritty and oily. COMBINE macaroni, butter, shredded cheese, cream cheese, Parmesan, evaporated milk, whole milk, garlic powder, onion powder, paprika, salt, pepper, nutmeg, and Worcestershire sauce in the Cosori Multicooker. Mix well and make sure most of the macaroni noodles are submerged in the milk. Cover with lid. SELECT Slow Cook (High), and press Start/Cancel. Cook for 2 to 3 hours, or until all the pasta is cooked through and the sauce has thickened. Check after 2 hours. If it is too thick, add a little bit more milk and continue cooking, checking every 20 minutes, until pasta is fully cooked. SERVE while hot and add Tabasco to taste. BREAK APART the cauliflower into individual florets and place in a food processor or blender. Pulse until the cauliflower resembles rice. USE a kitchen towel or cheesecloth to drain all of the water out of the cauliflower (optional). SET the Cosori Multicooker to the Sauté function and adjust to 326°F. ADD in the butter when ready and, once the butter has melted, add in the carrot, onion, peas, and garlic. Cook for 8 minutes or until the onions have become soft and translucent. MAKE ROOM for the eggs in the multicooker and once added, constantly stir them until they are just cooked, about 2 to 3 minutes. Mix well. ADD in the soy sauce, oyster sauce, and sesame oil. Mix until well combined. Cook for an additional 2 minutes. SELECT Brown on the Cosori Multicooker and press Start/Cancel. When ready, add in the oil and butter. Once oil is hot, stir in mushrooms with a pinch of salt. COOK the mushrooms, stirring occasionally, until any liquid evaporates and mushrooms are light brown, about 8 to 10 minutes. ADD in the shallots and cook until shallots are translucent, about 3 to 5 minutes. ADD in the Cognac and champagne vinegar. Cook until liquid evaporates and mushrooms have absorbed liquid, about 1 minute. Add in the crème fraîche, chicken broth, and tarragon. Press Start/Cancel. SELECT Sauté on the multicooker and cook until mushrooms are tender, about 10 minutes. Set aside and clean the multicooker pot. SELECT Boil (L) on the Cosori Multicooker and press Start/Cancel. Add in the water, salt, and white pepper. WHISK in the polenta when the water is boiling, about 10 minutes. Press Start/Cancel. SELECT Simmer, set the time for 30 minutes, and press Start/Cancel. Cook the polenta for 20 to 30 minutes or until it has reached desired thickness. ADD in the butter, heavy cream, milk, and Parmesan. Mix until well combined. SERVE hot in bowls and top with the mushroom ragout. ADD the rice, milk, cream, brown sugar, butter, salt, cinnamon, nutmeg, and vanilla extract into the Cosori Multicooker. Cover with lid. SELECT Rice (N) and press Start/Cancel. STIR in the raisins and let it heat through for 2 minutes when the cooking cycle has finished. SERVE hot or chill overnight. COMBINE flour, oats, brown sugar, salt, cinnamon, and nutmeg in a small bowl. MELT in the butter, then stir in the flour mixture until all the butter is absorbed and little clumps form. COOK the crumble for 10 to 15 minutes, or until nicely browned. TRANSFER crumble to large plate to cool. Set aside. MIX together the apples, blackberries, lemon juice, powdered sugar, and cornstarch in a large bowl. Set aside. SELECT Bake on the Cosori Multicooker and press Start/Cancel. Allow the multicooker to heat up. MELT in the butter, and add in the fruit mixture. Cook for 3 minutes. ADD in the water and cinnamon stick, cover, and bake for 10 to 15 minutes. SERVE the fruit filling in bowls. Top with crumble and a scoop of vanilla ice cream. SELECT Bake on the Cosori Multicooker and press Start/Cancel. Allow to heat up. MELT the chocolate in the microwave in 30-second intervals, until the chocolate has a smooth consistency. Set aside to cool. CREAM the butter and sugar by whisking them together until it forms a pale yellow color in a large bowl. MIX in the eggs one at a time until each one is well incorporated into batter. ADD in the flour, espresso powder, vanilla, and salt. Whisk until everything is well combined. WHISK the melted chocolate into your mixture. DISTRIBUTE evenly between 2 greased 3-inch ramekins. PLACE the ramekins on top of a rack in the preheated multicooker and cover. Cook the cakes for 25 minutes. REMOVE the ramekins from the multicooker when done cooking and run a knife along the edges to easily remove the cakes from the ramekin. SPRINKLE with a dusting of powdered sugar and some fresh raspberries. PLACE the steam rack inside the Cosori Multicooker and add 1 cup of water. SELECT Steam and press Start/Cancel. Allow the multicooker to heat up. WHISK together the egg yolks and sugar, until sugar is completely dissolved, in a large bowl. MIX in the heavy cream, milk, and vanilla, and whisk lightly until well combined. Whisking too vigorously may cause your mixture to bubble, which produces a less creamy crème brûlée. POUR the liquid mixture evenly into three 3-inch ramekins and cover tightly with foil. PLACE the ramekins on the rack, cover, and steam for 15 minutes. ALLOW the crème brûlée to rest inside the multicooker for 10 minutes, after it is done cooking. REMOVE the crème brûlée from the multicooker and remove the foil. COOL the crème brûlée completely, about 1 hour. Then, place them in the fridge for about 1 additional hour until chilled. ADD about a ½ tablespoon of granulated sugar on top of each crème brûlée serving, and caramelize using a kitchen torch. COAT the cooking pot of the Cosori Multicooker with nonstick cooking spray. LAYER the bread cubes and blueberries into the prepared pot. WHISK the milk, cream, eggs, sugar, vanilla, salt, and cinnamon in a medium bowl, until frothy. POUR the egg mixture over the bread mixture and press down on the bread to make certain all of it is submerged. SELECT Slow Cook (High) for 4 hours. SELECT Bake, set to 325°F, then press Start/Cancel. Allow the multicooker to heat up. Microwave butter for 1 minute or until completely melted. POUR the cornbread batter in a greased, preheated multicooker and bake with the lid on for 30 to 35 minutes. REMOVE cornbread carefully from the pan by flipping it onto a flat surface. CUT into desired bite-size pieces. SELECT Brown and press Start/Cancel. Wait until the Cosori Multicooker has heated up. ADD the oil and butter and allow to heat up for 30 seconds. Add mushrooms. BROWN the mushrooms for 8 to 10 minutes. ADD in the garlic and shallots and cook for an additional 2 minutes. Add the wine. REDUCE the wine until it is evaporated by half, about 2 to 3 minutes. ADD in the bay leaves, tarragon, rice, beef stock, salt, and pepper. Mix well. BRING to a boil. Once boiling, press Start/Cancel. Cover with lid. SELECT Simmer and cook for 18 minutes. Press Start/Cancel. 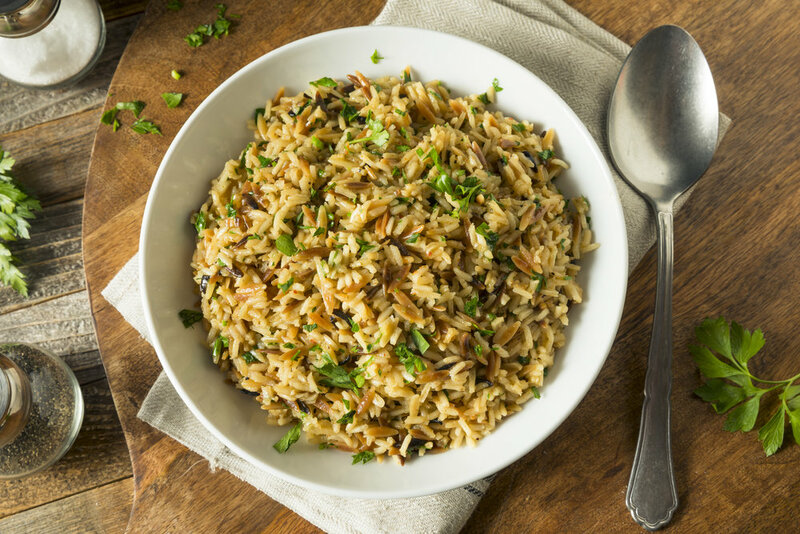 FLUFF the rice with a fork, adding in the freshly chopped parsley. COMBINE the ground pork, cabbage, ginger, garlic, soy sauce, sesame oil, water, scallions, and white pepper. Mix until well combined and set aside. ADD 1½ teaspoons of filling to the center of a gyoza wrapper. Moisten 1 edge of the wrapper with a wet finger, then fold the gyoza, closing the dumpling. SEAL by using your thumb and forefinger of one hand, form 6 tiny pleats along the unmoistened edge of the wrapper. COVER the dumplings loosely with dampened cloth or paper towel to keep from drying out. Form remaining dumplings in the same manner. SELECT Brown on the Cosori Multicooker, adjust the temperature to 375°F, add the vegetable oil, and press Start/Cancel. Allow the multicooker to heat up. PLACE the pot stickers into the multicooker standing up. Brown for 3 minutes. ADD ½ cup of water and cover with lid. Steam the dumplings for 5 to 7 minutes. Add more water if all the water has evaporated. SERVE your potstickers with the soy dipping sauce. SEASON the ahi steaks with salt and pepper. MIX together all of the sesame seeds in a shallow dish. DREDGE the steaks in the sesame seeds, coating the tuna evenly. Set aside. SELECT Brown on the Cosori Multicooker, adjust temperature to 375°F, and time to 5 minutes. Allow to heat up. ADD the oil and allow to heat up for 1 minute. COOK the ahi tuna steaks on each side for 1 minute. You may need to work in batches of 2. REMOVE the tuna from the multicooker and onto a cutting board. CUT the tuna in ¼-inch slices.